Author/Opus: This is the 35th puzzle from our contributing puzzlemaster Tom Collyer. Answer String: Enter the length in cells of the horizontal loop segments from left to right in the marked rows, starting at the top. If the loop only has vertical segments in the marked row, enter 0. Separate each row’s entry with a comma. Note: Follow this link for other classic Masyu. 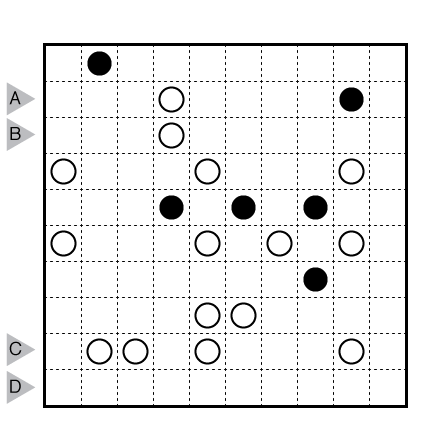 If you are new to this puzzle type, here are our easiest Masyu to get started on. More Masyu puzzles can be found in The Art of Puzzles. Some nice logic! Gur znva oernxguebhtuf sbe zr jnf abgvpvat gung gur qbhoyr juvgrf ng gur gbc sbepr na rneyl ybbc pybfher va bar qverpgvba, naq gura fbzr raq pbhagvat gb pbzcyrgr gur hccre unys bs gur chmmyr. However, unless I’m missing something simpler, those tricks seem mean for a Tuesday difficulty puzzle. Qvq lbh hfr E5P4 unf gb tb qbja? Jvgu gung, V pna trg n ybg bs ybbc frtzragf qenja naq gur fgvpxvat cbvag vf yvxr jung lbh zragvba (E1P4 pnaabg tb qbja jvgubhg pybfvat n ybbc) ohg ab zber raq pbhagvat vf arrqrq nsgre gung. V guvax V unq E5P4 cbvagvat qbja, nygubhtu erfbyivat gur qbhoyr juvgrf sbeprf gung va gur raq. Gur fcrpvsvp raq pbhagvat fpranevb gung unq zr chmmyrq qhevat fbyir unccraf evtug nsgre gur qbhoyr juvgrf ner erfbyirq; gurer ner guerr ybbc raqf va gur gbc gjb ebjf (juvpu sbeprf gur ybbc gb cnff guebhtu gur gbc evtug pbeare). Va uvaqfvtug vg frrzf zber snve fvapr obgu qrqhpgvbaf sbyybj rnpu bgure naq ner va gur fnzr nern, ohg va gur urng bs gur fbyir vg zhfg unir ragrerq n oyvaq fcbg! 1:02. Didn’t see any mean tricks here, just a few applications of qbag pybfr gur ybbc!